Let Amtrak take you to over 500 exciting destinations -- right here on our new Web site. Cruise our site to learn about our trains, routes, services, vacation packages and other news. Create your own virtual adventure, then find out how to make your trip a reality! © National Railroad Passenger Corporation 1996. All Rights Reserved. Amtrak® is a registered service mark of the National Railroad Passenger Corporation. 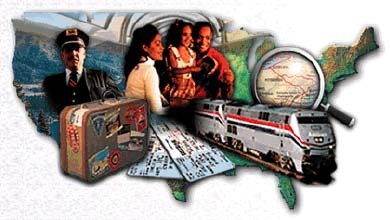 Amfleet®, Amtrak's Metropolitan Lounge®, Metroliner®, Superliner®, Three Rivers®, U.S.A.RAIL®,Viewliner® are registered service marks of the National Railroad Passenger Corporation. Modification of this site, or information found within this site, is prohibited without express written permission from Amtrak. Any modification or redistribution of the material within is a violation of applicable copyright laws.